The Iraq Britain Business Council (IBBC) invites you to attend its Ninth Annual Conference at the Mansion House on the 10th of April. This year’s conference is organised in partnership with the Central Bank of Iraq and the Iraqi Private Banking League. With a strong focus on the Iraqi banking sector, two sessions of the conference will be devoted to financial sector issues. Other areas will focus on building human capital in the public and private sector and on oil & gas. “The security situation in Iraq is now much improved, with a new Government in place that has a clear mandate from the people to improve governance and to provide important basic utilities. 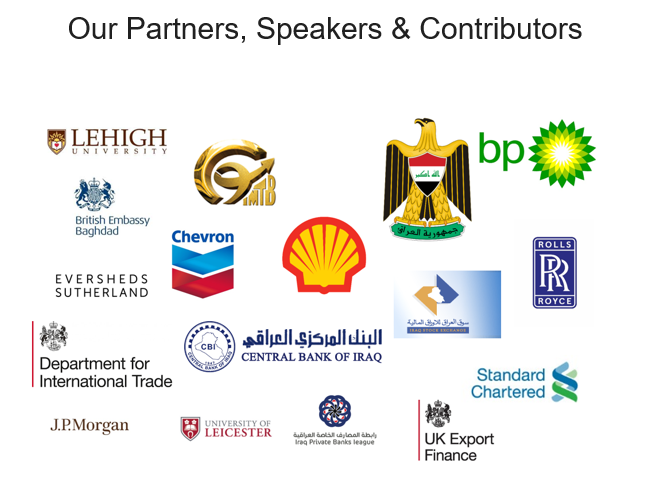 IBBC is the Iraqi Governments private sector partner of choice for developing the private sector in Iraq. We firmly believe that only private enterprise can meet the challenges facing Iraq by developing a modern economy”. H.E. Dr Fuad Hussein, Deputy Prime Minister and Minister of Finance will lead a high level delegation alongside Dr Mehdi Al Alak, Secretary General of the Council of Ministers, officials from the Central Bank of Iraq, a delegation from the Iraq Private Banks League and the Governors of Erbil, Sulamania and Karbala. A large delegation of Iraqi Businessmen from all governorates of the country will also be in attendance. Round-table discussions will take place with Iraqi officials, including the Iraqi Governors, where delegates can engage in concentrated debates on country specific issues. As well as specific round-tables on Tech in Iraq and Women’s Group. Dr Mehdi Al Alak, Secretary General of the Council of Ministers will present a paper on ‘Private Sector Development and Investment in Iraq‘. Delegates will receive an exclusive insight into the Government’s planned measures and strategies to realise this ambition. There will also be special presentations by the Central Bank of Iraq and Basra Gas Company. Dr Renad Mansour, Research Fellow at Chatham House and the preeminent voice on Iraq in the UK is publishing a briefing paper specifically for the IBBC conference, discussing the short to medium term economic and political outlook for Iraq. Baroness Nicholson of Winterbourne, President of IBBC and the Prime Minister’s Trade Envoy to Iraq, Azerbaijan, Turkmenistan & Kazakhstan will open the conference, alongside The Lord Mayor Locum Tenens, H.E. Dr Fuad Hussein, Deputy Prime Minister, Minister of Finance, Jon Wilks CMG, Her Majesty’s Ambassador to Iraq and Louis Taylor, Chief Executive of UK Export Finance (UKEF). Dr Mai Yamani will be presenting the closing remarks for this important event. The conference is being generously supported and sponsored by Shell, Rolls-Royce, Standard Chartered Bank and Eversheds Sutherland. For more information email london@webuildiraq.org or telephone 020 7222 7100.